Using a reduced isotropic crystal model the relationship between the fourth-order elastic moduli of an isotropic medium and the independent components of the fourth-order elastic moduli tensor of real crystals of various crystal systems is found. To calculate the coefficients of these relations, computer algebra systems Redberry and Mathematica for working with high order tensors in the symbolic and explicit form were used, in light of the overly complex computation. In an isotropic medium, there are four independent fourth order elastic moduli. This is due to the presence of four invariants for an eighth-rank tensor in the three-dimensional space, that has symmetries over the pairs of indices. As an example, the moduli of elasticity of an isotropic medium corresponding to certain crystals of cubic system are given (LiF, NaCl, MgO, CaF2). From the obtained results it can be seen that the reduced isotropic crystal model can be most effectively applied to high-symmetry crystal systems. 1. Tucker J.W. and Rampton V.W. Microwave Ultrasonics in Solid State Physics. − Amsterdam: North Holland, 1972. – 418p. 2. Landau L.D., Lifshitz E.M. Theory of Elasticity. − Oxford: Butterworth-Heinemann, 1986. − 187 p.
3. Fedorov F.I. Theory of Elastic Waves in Crystals. − New York: Plenum Press, 1968. – 375 p.
4. Akhiezer A.I., Aleksin V.F., Khodusov V.D. Gas dynamics of quasi-particles // Low Temp. Phys. – 1994. – Vol.20. – P.939. 5. Poluektov Yu.M. Self-Consistent Description Of Interacting Phonons In A Crystal Lattice // East Eur. J. Phys. − 2016. – Vol. 3. – No.3. − P. 35-46. 6. Krishnamurty T.S.G. Fourth-order Elastic Coefficients in Crystals // Acta Cryst. − 1963. − Vol. 16. − P. 839-840. 7. Destradea M., Ogdenb R.W. 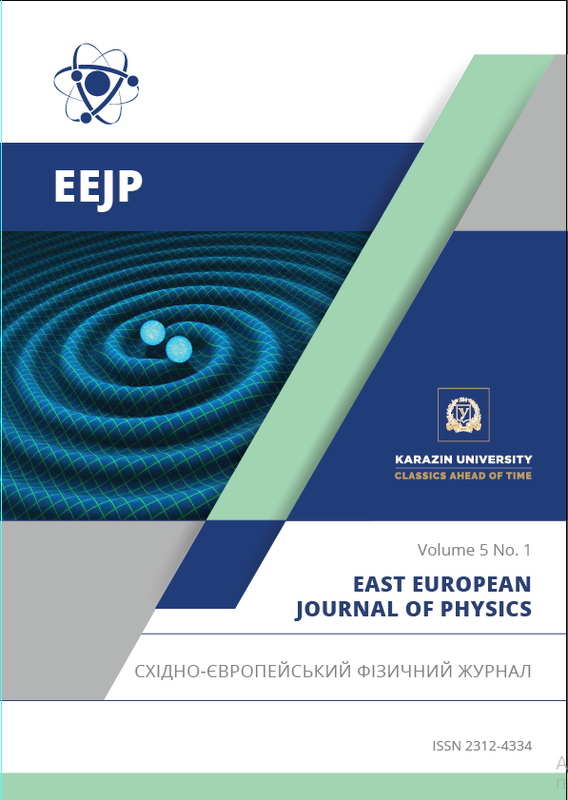 On the third- and fourth-order constants of incompressible isotropic elasticity // The Journal of the Acoustical Society of America. − 2010. − Vol. 128. − P. 3334-3343. 8. Garg V.K., Puri D.S., Verma M.P. Many-Body Effects on the Fourth-Order Elastic Constants of Ionic Solids // Phys. Stat. Sol. (b). – 1977. − Vol. 82. − P. 325-334. 9. Goyal S.C., Sharma A.K. Fourth-Order Elastic Constants of Fluorite Structure Solids // Phys. Stat. Sol. (b). – 1988. − Vol. 146. − P. 435-443. 10. Krishnamurty T.S.G., Gopalakrishnamurty P. Elastic coefficients in crystals // Acta Cryst. − 1968. − Vol. 24. − P. 563-565.